Do you desire to make your wardrobe fashionable? Fashion is usually synonymous to women. For men, it is mostly thought of that they have nothing to do with fashion and that all that they have an option is to wear a pair of trousers and team it up with a shirt or t-shirt. Not anymore though! Like women, men too have some wardrobe essentials. With some essential stuff in the wardrobe, a versatile and unique collection can be easily carried out with panache. In terms of styling, men too have some do’s and don’ts. Adhering to these major factors would help in deciding the personality and style of a man. A sensible choice of these essentials can make a man look elegant, classy and charming. Picking right clothes is very important both in casual and professional scenarios. Right clothing injects confidence, makes a person look stylish and also attracts women. Apart from clothes, accessories play an important role in completing the look. Shoes, belts, sunglasses, and so on go a long way in complementing the style. Proper combination of clothes and accessories is required for a perfect flawless look. Check out some essential wardrobe options for men in the following lines. A man’s wardrobe is incomplete without a classic suit. Whether it is a formal party, a wedding or an important business meeting, a man’s wardrobe without suit is unthinkable. 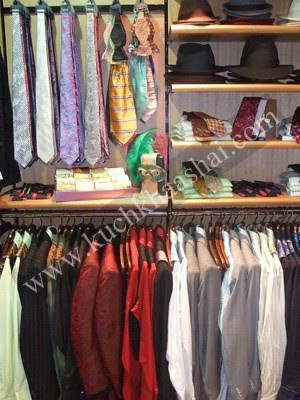 For businessman and professionals, suit is the most important wardrobe essential. The suit must be traditional, having only two buttons, dark color and of comfortable fabric. Men often choose woolen fabrics which look good at any place, from a business meeting or wedding. Pick up a suit that fits you well and makes you look handsome. A plain white button-down shirt is the very basic essential in a man’s wardrobe and a must-own for all men! Formal basic shirts can be teamed up with anything such as jeans, trousers, with a tie, under a suit, etc. Shirts with light strips and neutral colors also fulfill the same. Checks are also in fashion these days. If you want to flaunt your body, go through the racks to find nice-fitted slim shirt. These are available in large numbers and offer a smart, elegant and stylish look to the wearer. What is salt to food is denim to wardrobe - cannot be done without, by any chance. Well-fitted basic denim cannot be compromised with anything and is a must-have for all men. While in the yesteryears, basic blue denim ruled the roost, the place has been taken over by hues of black and grey. For a young guy, baggy, ripped, or distressed jeans are great option nowadays. However, the glory of having basic blue denim is simply unmatchable. A plain straight cut jean when combined with a shirt or any polo t-shirt will never let you down. Ties with dark colors and diagonal strips are unbeatable. Remember to have a black tie in your wardrobe. Always go for dark neutral shades. Combine basic tie with a formal shirt for that dashing look. However, make sure you make a wise color combination; lest you end up looking like a clown. V-neck sweaters are casual and add an extra elegance to the overall attire of men. They can be worn over jeans, formal pants and even nice shorts. If you are teaming a v-neck lined sweater with a formal shirt, top it up with a nice blazer for that enhanced effect. Else, you can simply wear it over jeans and on a white shirt. For a business casual look, the wardrobe must have polo shirts in a variety of colors. While polo shirts look good with blue denims, you can pair it up with khakis and chinos as well. Don’t make a clown of yourself by opting for different color shirt, bottom and shoes. Make a wise color choice. For a little casual look, khakis are the best choice. They can be worn with any kind of upper. If you want to add an extra charm to your look, team it up with a nice elegant blazer. What is jewelry to women is belt to men - crucial accessory that is a must-have. Most men today wear pants without a belt, which is a complete disaster. Belt is an easy way to add polish and bling to the entire outfit, making the whole appearance range from being just fine to fantastic. Traditionally available only in leather, belts today can be found in various textures and designs. While adorning a belt, make sure that the color of your shoes and belts matches, lest you give an uncoordinated look. It is believed that the personality of a man is judged by the kind of shoe he wears, which itself goes on to prove how important shoes are in a man’s wardrobe. Shoes are available in a number of types and colors. One can have a pair of black shiny shoes with tie up laces for a formal look, a pair of sneakers for a complete casual look, stylish sandals defining the cool look. On trousers always go for formal shoes. With jeans, you can either go with the sandals or sneakers. For those who want to give off a cool look, go for slip-ons. A hat is another essential which adds a classy look to men. For the formal wear, an elegant dark colored leather bag is perfect, while for a casual look, one can go for long denim bags. Most of the professionals carry their laptops, so a strong, durable, dark colored laptop bag is a must for them. Sunglasses also make a necessary wardrobe essential, especially during summers. They not only provide protection to your eyes, but also make a person look handsome and charming. Nice deodorants and perfumes are also very essential in a man’s wardrobe. These are some essential wardrobe options for men. Including these in your wardrobe collection will make you look extremely handsome, charming, attracting and perfect, wherever you go.